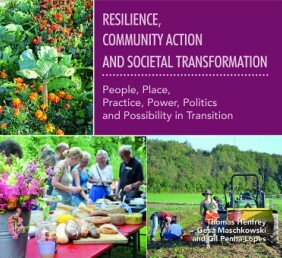 (07 February 2017) – ‘Resilience, Community Action & Societal Transformation’, an ECOLISE publication, is a unique collection bridging research, theory and practical action to create more resilient societies. It includes accounts from people and organisations at the front line of efforts to build community resilience, cutting edge theory and analysis from engaged scholar-activists, and commentary from sympathetic researchers. Its content ranges from first hand accounts of the Transition Movement in the UK, Canada and Spain, theoretical reflections on resilience theory from Transition Network, challenges to accepted ideas of resilience in politics and sustainability practices, the shifts in mindsets and perspectives required for transitions to sustainability, and post-colonial perspectives on Transition. It includes substantive contributions from activists and activist-scholars such as Lorenzo Chelleri (Gran Sasso Science Institute, Italy), Juan del Rio (Transition Spain), Naresh Giangrande (Transition Network), Maja Göpel (Wuppertal Institute), Thomas Henfrey (Transition Research Network), Justin Kenrick (Forest People’s Programme), Glen Kuecker (University of Indiana), Cheryl Lyon (Transition Peterborough Ontario) and Gesa Maschowski (Transition Bonn), along with briefing notes from noted experts in resilience. The result is a compelling cocktail of insights, ideas and action points likely to define the scientific and practical fields of community resilience for years to come.